Apple’s Mac OS X’s a great operating system, but however much you love it, few of us can get by without running Windows for some reason or another. When it comes to running Windows on your Mac, you have two choices: use Apple’s boot camp or run Windows virtually using either Parallels Desktop or VMWare Fusion. When Snow Leopard was released, new versions of both these applications were released, each offering their own strengths and weaknesses. Parallels Desktop 5 comes with some great new features, some more polished than others, and offers a great incentive when using Windows applications in an OS X environment. Setting up Parallels is an extremely simple process which allows you to install an OS of your choice (Windows or Linux) virtually, by using either a physical install disk or installing from a disk image (this comes in handy when installing Linux distributions especially, as many are downloaded as an .iso image). The install process is the same as you’d see when installing Windows on a physical drive, so there’s nothing unfamiliar to worry about – in fact, it’s significantly simpler, as you Parallels requests your Windows license key before installing, to make the process as automated as possible. I found this handy when doing various things at once, as I didn’t have to check whether XP was ready to ask me for my region settings every 5 minutes! If you’re installing Windows on your machine, you have a choice of various settings for file sharing between the host machine and the guest OS. Here, you can decide what settings you prefer when you decide whether to enable file sharing and user profile sharing. One thing I was curious to check out when setting everything up was the ability to use my Boot Camp partition virtually. I’ve had a Boot Camp partition for quite some time, so it has a lot of applications and user data that I’d rather not set up again in an entirely new Virtual Machine! To use a Virtual Machine with your Boot Camp partition requires that you create a new virtual machine, but instead of choosing an installation CD/DVD or image, use your Boot Camp partition as the operating system source. It’ll detect whatever operating system is running on the partition as normal and allow you to create the VM. While it’s creating your machine, the Boot Camp partition will be unmounted, so make sure you’re not using it for anything or else the process won’t be able to complete. It took a matter of seconds for the VM to be created, but the machine had to be configured before first time use. Once you have your virtual machine set up, Parallels will create a shortcut to it on your desktop – if you don’t want it on your desktop, you can Trash it without worrying about losing your machine, as your virtual machine file is saved in the “Parallels” folder in your documents. To save time, you can select a virtual machine, and it will load up. Boot time will depend on how you ended your last session, as you have the choice to either “Suspend” or “Shut Down” the VM. Suspend is like Hibernate mode on Windows, where your current session is saved and then when you come back to your machine another time, everything will be where you left it. When testing Parallels 5, I decided to use two host machines: a 2.4GHz Unibody Macbook Pro laptop, with 4GB DDR3 RAM running Snow Leopard and a 2.0GHz Mac Mini with 2GB of DDR2 RAM, also running Snow Leopard. As well as this, I used Windows XP Home Edition, Windows 7 Home Premium (64-bit) and Ubuntu 9.10 as virtual machines, to test performance and compatibility. If you’re lucky enough to be using a Mac Pro, you’ll be able to assign up to 8 processor cores to your virtual machine (this, of course, depends on if you have 8 cores available in your machine…) by selecting the “Virtual Machine” drop down menu and going into the configuration options for your machine. You can also allocate the amount of RAM you want to give to the host OS as well as managing other options, such as video memory and security options. If you aren’t comfortable with going into the advanced options, you can let Parallels take care of resource management for you, by selecting “Optimization” under the “Options” tab. I found the performance of both the host OS and guest OS to be good when allowing Parallels to manage my resources for me, and if you’re running an intensive task on either the host OS or virtual machine, you can choose how performance is optimised (for either your physical machine or virtual machine). One thing that’s always concerned me, especially on portable machines, when running VM’s is power consumption, which seems to go through the roof when running a virtual OS. In Parallels, you can manage power consumption a bit more, by selecting to either preserve battery life or deliver better performance. I would have preferred a more automated option, so that when I wasn’t connected to a power source, it automatically switched to preserve battery. This would save the time it takes to go through the configuration and do it manually. The final option that improves the performance of your machine here is the ability to “Tune Windows for speed”. It appears a small option, but will help minimise the footprint of Windows’ resource hungry nature by offering quicker boot times by disabling the animated Windows logo, and disabling SuperFetch on Windows, which preloads frequently used applications, including office, using more resources. By tuning Windows, I found performance improvements to be marginal, but definitely worth using if you’ve got a lot of processes running in either the host or guest machine. Ok, so you’ve got the various settings in order, but what about actually using your Virtual Machine? If you’ve used Parallels before, you’ll be accustomed with the various ways of viewing Windows. 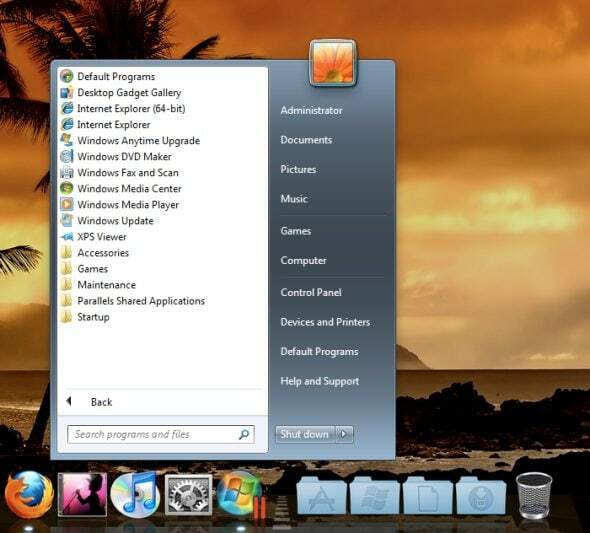 You can choose Window view, which will run Windows in a separate window alongside OS X applications – you’re limited to running Windows applications in a Windows environment and can’t blend windows in with OS X.
Modality mode allows you to view all of your virtual machines and applications in transparent windows, and Coherence mode takes this one step further by allowing you to run your Windows and Mac OS X applications alongside each other without having to fully interact with Windows. If you want to be running Windows without seeing Mac OS X, you can choose full screen mode. Along with these choices offered in previous versions, you also have another view in Parallels 5, called “Crystal mode”. Similar to Coherence mode, your Windows and Mac OS X applications will run side by side, but goes that extra mile to remove the Windows user interface and allow you to use your computer without having to see the Parallels icon – the start menu button is relocated to the menu bar of OS X and you can access all your Windows applications from a stack offered on the dock. I found Crystal mode under Parallels 5 to be surprisingly easy to get used to and manage – the start menu’s still just a click away and the Windows applications folder on your dock blends in with your other folders. The other UI improvement to Parallels 5 is “MacLook”, which skins all of your Windows applications so that they blend in with an OS X theme. Like selecting a mode, this is easy to access via the “View” menu on your OS X menu bar. The effects of this were hit and miss – once MacLook had initialised, it offered a great theme to your windows, despite the OS 9-esque window headers. When the interface was loading, it took about 30 seconds to swap from the Windows theme to the MacLook theme, but the end results were pleasing even though the feature could definitely be refined in future versions. It would have been better if the switch didn’t look so painful – running in Coherence or Crystal mode, the main window would become visible, then black out before returning with a new theme a few short crashes later. The whole process seemed slightly unstable, and needs working on for future releases. It’s also worth noting that you won’t be able to use Coherence or Crystal mode when using Linux distributions – you can only view the OS in window, modality or full screen mode. This is definitely an area which could be improved, as I use Parallels as much for Linux as I do Windows, and would love to be able to use it in Coherence with OS X. It’s a definite feature request for the next update of Parallels, one which I’d love to see. If you have a Mac with a multi-touch trackpad, you’ll no doubt be happy to hear that you can use multi-touch with your Windows applications! This was without a doubt my most wished for feature for the new version of Parallels, and they duly delivered. Using Multi-Touch was more comfortable on the virtual machine than I’ve experienced with my boot camp installation, and it was definitely an advantage when using applications with Parallels. By default, support for gestures and apple remote is enabled, but can be easily disabled if you don’t want to use them with Windows by going into the customisation menu and selecting “Gestures & Apple Remote” from the sidebar menu. Unfortunately there’s a distinct lack of love for Linux in the gestures department too, which was disappointing, although Ubuntu supports two finger scrolling using the Macbook’s trackpad anyway, so it wasn’t as much of an annoyance as one may expect. Still, it’d be great to see some more Linux features enabled. When it comes to graphics options on virtual machines, you often are left with few choices, but I was pleasantly surprised to find support for OpenGL 2.1 in not only Windows, but Linux OS’s too. What does this mean when you’re using Parallels? 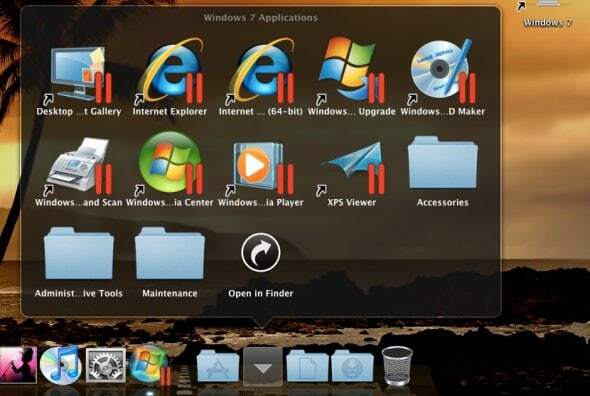 If you’re using Windows, you’ll be able to use the “Aero” theme in Windows Vista and Windows 7. This also applies when you’re using Coherence and Crystal mode, which is a great addition to the user experience. With this upgrade in tow also comes much better performance when playing games in a Windows environment. Before Parallels 5, I wouldn’t have recommended virtual gaming to anyone wanting decent performance, but with Parallels 5, I struggle to find any major complaints when running GPU intensive applications. Using the Macbook, I was able to play any game ranging from FarCry to even Call of Duty 4 with decent performance. Obviously, you still won’t get performance as you would running Windows from a separate partition, but you’ll definitely notice a performance boost from Parallels 4. If you’re a Linux user, you’ll find full support for Compiz too, which is great to have in a virtual environment, as it gives you the flexibility and visual effects that you’d have in a dedicated installation. I often have Compiz features enabled when using a Linux distribution, so having it is a big advantage. One of the big reasons people use Mac OS X is because of security – there are far fewer viruses out there for Mac OS X compared to Windows, but if you run Windows under boot camp or a virtual machine, and get a virus, won’t your Mac be susceptible too? The short answer is yes, and although no operating system is ever fully secure, your chances of getting a virus are a lot higher when running Windows. The answer? 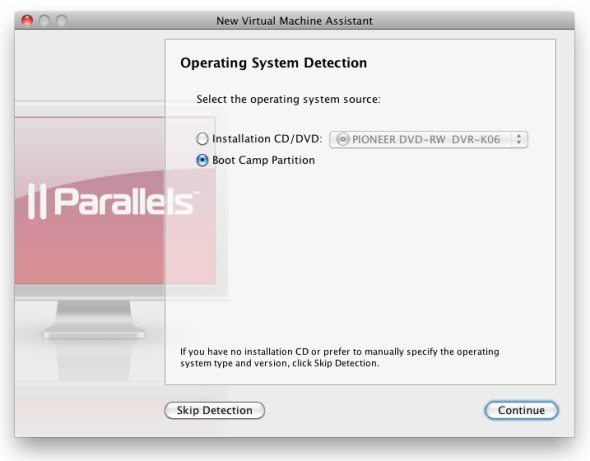 Well, if you’re running Parallels 5 you can isolate the virtual machine from your host machine. This means that you can no longer share files between the machines, but you can set a password so that users can’t add or remove programs without permission and minimise the risk of viruses by isolating the machine from OS X. This would be a good option to have, especially if you use a shared computer where other users could fill your VM with viruses! Included with Parallels is Kaspersky Internet Security too, which is a fantastic addition, as I consider it to be the best anti-virus out there, so the chance of infection is minimal. Parallels was always a great piece of software for any OS X owner, and with the new features of Parallels 5, such as Multi-Touch and Crystal Mode for Windows, it’s a must have. I was slightly annoyed that some of the features available for Windows aren’t available for those running Linux virtually, and hopefully there’ll be more support for us open-source guys in the future! 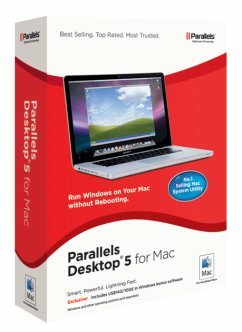 You can purchase Parallels Desktop 5 for around £60, or if you have a previous version, you can upgrade to Parallels 5 for around £40. Have you got any thoughts on running virtual machines, or feature requests for the next version of Parallels? Let us know in the comments!